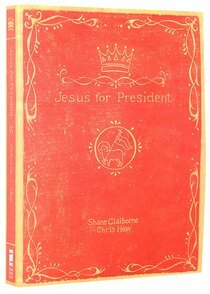 Jesus for President is a radical manifesto to awaken the Christian political imagination, reminding us that our ultimate hope lies not in partisan political options but in Jesus and the incarnation of the peculiar politic of the church as a people "set apart" from this world. In what can be termed lyrical theology, Jesus for President poetically weaves together words and images to sing (rather than dictate) its message. It is a collaboration of Shane Claiborne's writing and stories, Chris Haw's reflections and research, and art and design. A fresh look at Christianity and empire, Jesus for President transcends questions of "Should I vote or not?" and "Which candidate?" by thinking creatively about the fundamental issues of faith and allegiance. It's written for those who seek to follow Jesus, rediscover the spirit of the early church, and incarnate the kingdom of God. Shane Claiborne, author of The Irresistible Revolution, Jesus for President and most recently Becoming the Answer to Our Prayers, and with John Perkins Follow Me to Freedom: Leading as an Ordinary Radical is a prominent activist and sought after speaker. He is one of the founding members of The Simple Way, a community in inner city Philadelphia that has helped birth and connect radical faith communities around the world. Shane serves on the board of directors for the Christian Community Development Association, and in his down-time is quite a dynamic circus performer.